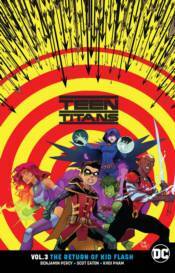 After Robin kicked Kid Flash off the team, the Teen Titans have an open slot in their ranks. Raven, Aqualad, Starfire and Beast Boy wants to give Wally a second chance, but Damian has someone else in mind to fill the vacancy: Green Arrow's half-sister, Emiko! Will the Red Arrow prove her worth or prove to be Damian's undoing? Plus, Beast Boy's suspicious new employer leads the team into danger! Collects TEEN TITANS #13-14, #16-19 and a story from DC HOLIDAY SPECIAL 2017.